QuickBooks 2012 allows you to set up several passwords for the QuickBooks 2012 data file. What’s really neat about this is that you can tell QuickBooks 2012 to limit certain users and passwords to do only certain things. The business owner, for example, may have a password that allows her to do anything. But a new accounting clerk, for example, may have a password that only allows him to record bills into the system. Choose the Company→Users→Set Up Users and Roles command. 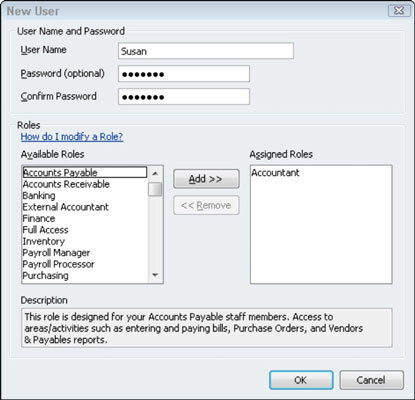 QuickBooks 2012 displays the User List dialog box, as shown in the illustration below. The Users and Roles dialog box identifies any users for whom QuickBooks access has been set up and the roles QuickBooks can fill when using QuickBooks. The Users list, which shows on the User List tab of the dialog box, also identifies who is currently logged on to the system. Tell QuickBooks 2012 that you want to add a user by clicking the New button. When you click this button, QuickBooks displays the New User dialog box, as shown. Identify the user and supply a password. You need to give each user for whom you are setting up a password a username. You do this by entering a short name — perhaps the user’s first name — into the User Name box. After you identify the user, you enter the user’s password into both the Password text box and the Confirm Password text box. Use the Available Roles list box to select the roles (or duties) the user fills. Then add the selected role to the user’s list of assigned roles by clicking the Add button. 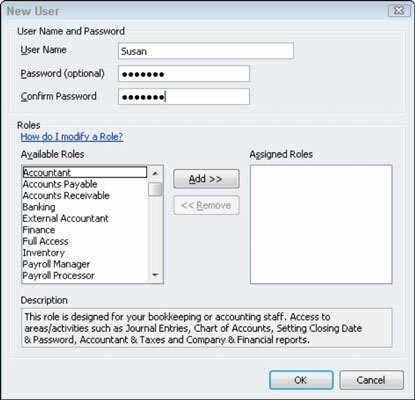 The following figure shows user Susan with Accountant listed as an assigned role. 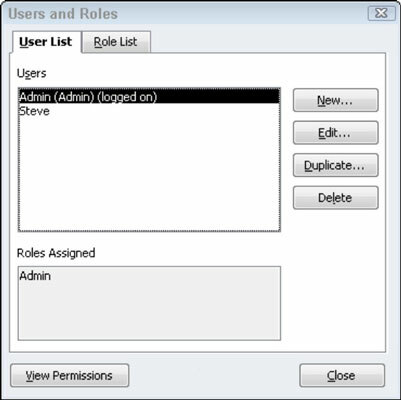 To remove a role from a user, select the role from the Assigned Roles list box and then click Remove. (Optional) Modify roles as necessary. 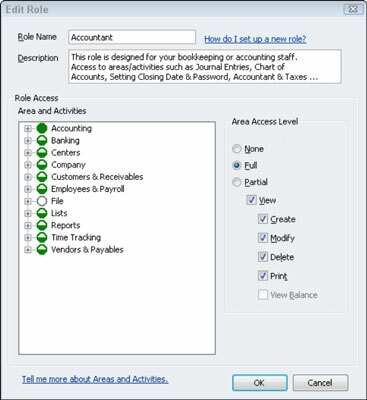 You can fine-tune the roles that you, with QuickBooks’ help, assign. To do so, select the Roles tab on the Users and Roles dialog box and then click the role you want to change and the Edit button. When QuickBooks displays the Edit Role dialog box (see illustration below), select an accounting activity or area from the Area and Activities list and then use the Area Access Level buttons to specify what a user with the selected role can do. You can indicate that the user should have no access by selecting the None, Full or Partial access via the appropriate radio button. If the user should have partial access, you select the Partial button and then check or uncheck as appropriate the Create, Modify, Delete, Print, and View Balance boxes. Click OK to save any changes to the roles and return to the Users and Roles dialog box. As a general rule, when it comes to accounting controls, you want to provide the minimal amount of access. If someone doesn’t need access to the QuickBooks data file for day-to-day duties, you should select the None button. The more ability you give to noodle around in your accounting system, the greater the risk that someone can introduce errors into the system and the easier you make it for someone to steal from you. (Optional) Review your user permissions. After you set up a user, you should (just to be careful) review the permissions you’ve given the user. To do this, click the User List tab of the Users and Roles dialog box, select the user, and then click the View Permissions button. When QuickBooks displays the View Permissions dialog box, select the user and then click the Display button. The following illustration shows the View Permissions window, which displays a very detailed list of what the user can and can’t do.